In my previous post about the meridian passage long method, I demonstrated how the ‘Short Distance Sailing Formulas’ are used to calculate a vessel’s position at meridian passage. I have since received several questions asking how these formulas allow for the varying distances between the meridians of longitude. Therefore, this post is dedicated to the task of explaining how the short distance sailing formulas are derived. As I have done in all of my books, I will attempt to avoid over-complicated and stilted academic language and as far as possible, give my explanations in straightforward, plain English. Measuring the Distance Between Meridians of Longitude Along a Parallel of Latitude. In the diagram below, PBC and PAD lie on separate meridians of longitude. To Calculate The Distance Between Two Meridians Along A Parallel Of Latitude. The following formulas are used for calculating the difference in distance along a parallel of latitude (Ddist) corresponding to a difference in longitude (Dlong) and vice versa. The Rhumb Line. If a ship were to steer a steady course, that is one on which her heading remains constant, her track would cut all meridians at the same angle, as the next diagram shows. Such a line on the Earth’s surface is called a rhumb line. When the rhumb line cuts all meridians at 90o, it will coincide with either a parallel of latitude or with the Equator. 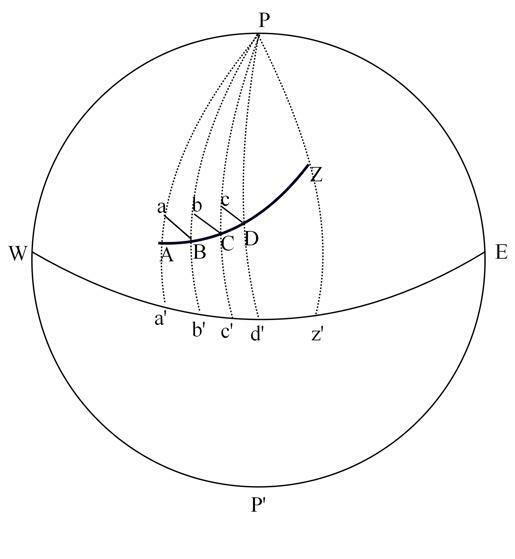 When the angle is 0o, the rhumb line will be along a meridian of longitude. 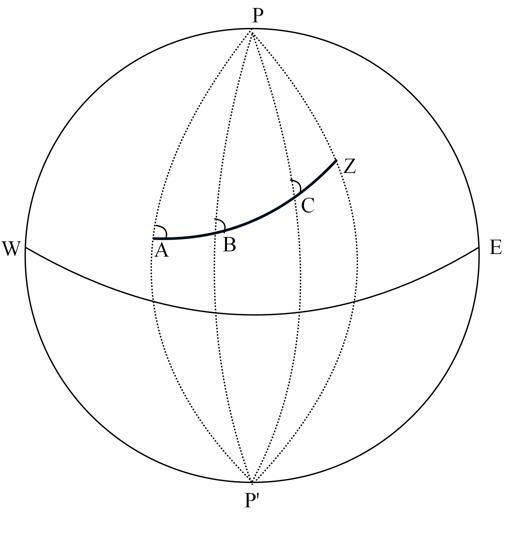 A vessel’s course will always be a rhumb line; thus the course to be steered to travel from one place to another will refer to the angle between the rhumb line joining the places and any meridian. Middle Latitude. If we were to calculate the departure along each of the parallels of latitude aB, bC, cD, we would find that they would not be equal and so the task of calculating the total departure would be complicated. In practice, the total departure is taken to be the east-west distance along the intermediate of these parallels which is known as the ‘middle latitude’. By the formula established for Ddist above, we can derive a formula to calculate departure as follows: Departure = d.long cos(middle latitude). 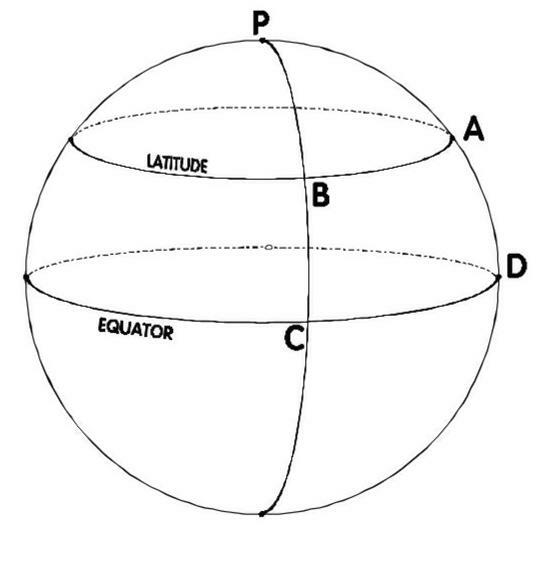 When the difference of latitude is large (over 600 n.m.) or the latitudes are close to either of the poles, the middle latitude must be used instead of the mean latitude and in these cases, we have the more accurate formula: Dep. = d.long cos(mid lat). Suppose a ship sails from position 50oN, 32oE., to 70oN., 15oE. The d.long is 17o and the mean latitude is 60o. The formula for calculating departure using the middle latitude is: Dep. = d.long cos(mid lat) = 1020 cos (61.15) = 492.17 n.m.
Dlong = Ddist ÷ Cos Lat = Ddist x Sec Lat. . 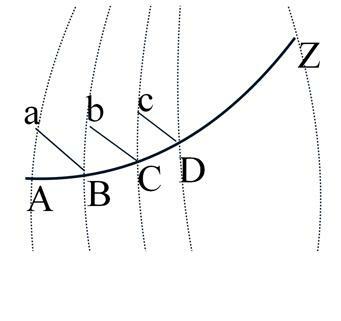 Consider triangle ABa in the diagram above: AB is the distance made good, aB is the departure along a parallel of latitude, angle aAB is the course angle. We have established formulas to calculate Dep and D.Lat; we now need a formula to find the course. Worked Example. What is the rhumb line course to steer and the distance to travel from position 40o.5N, 43o.0W to position 42o.25N 41o.8W? Distance to new position = 120 n.m.